What the world said after Mustafa Kemal Atatürk’s death…. I came to İstanbul for this purpose. I would not have been able to stand being apart from him forever, if I had not come here and cry in front of this great man. I came to İstanbul to express my respect for him. As soon as arrived, I went to the palace. I stopped in front of the coffin of my great friend, I bowed and I cried. My sorrow is no less than the Turkish Nation’s. I offer my condolences to the Turkish Nation through you. The loss of Great Atatürk has left us with great sorrow and pain and it is not possible for me to express my feelings in words. Because, Atatürk was not only the Ata (Ancestor) for Turkey, but for the Eastern World as well. Not only the King and the government, but the Nation of Afghanistan share your deep sorrow. In order to express our sorrow, we will keep the Afghan flag half-mast along with the Turkish flag. We have instructed all our embassies accordingly. Atatürk is the most distinctive personality of this century. With his voice, he has given life to the ideal that philosophers have given various meanings and poets have described with the most beautiful and most distinguished words. He has transformed words to practice and it is he is who created the language of this great practice. All Turkey mourns. Because the distinguished leader, the creator of new Turkey has passed away. Atatürk has changed the face of his country in a short while and has managed to make a modern state out of old Turkey. The Turkish Nation owe him whatever they have. The Albanian Nation shares the great pain that Turkish Nation feels because of this great loss. The grand resolve that has passed from Atatürk to his Nation with the revolutions he has carried out has shown the development and accomplishment to continue for a long time in a couple of years. He was a man of great thoughts … a state architect. Atatürk’s death is a great loss not only for Turkey but also for the whole world. Atatürk was the greatest symbol of capability and talent. He is the man who created the greatest reality of the 20th Century. In Ankara, I would look at the sun. However, I wouldn’t see the sun in the horizon but I would see it in Çankaya. Sincerely, I believed that the real sun was the one at Çankaya. The loss of Atatürk is a cause of great sorrow throughout the world. The King of Belgium, who always admired his high creativity and determined character, has sent me to this burrial ceremony to express his feelings. Belgiums mourns with you sincerely. The ceremony held at the National Assembly is a proof of it. Mustafa Kemal has achieved an extraordinary development for his country while everyone believed everything lost. Turkey’s international reputation, prestige and authority has risen to its peak. The only statesman to serve his country this efficiently in such a short period is Atatürk. A leader that devoted his reformist ambition to his nation. Atatürk has been a good example and lead the way to bring forth many energetic and loyal statesmen, soldiers, leaders and scientists. We hope the Turkish Nation will bear this great loss and we hope her loyal friends will cope with the difficulties expected to rise after the loss of such a great statesman. No country in the world has achieved developments thise nrgetically, this fast and this radically as Atatürk’s new Turkey. No country in the world has witnessed such a development this fast and this efficiently achieved as by Atatürk of new Turkey. He is known everywhere as a great soldier, an exceptional reformist and the deliverer of his country. Such personalities can only be seen once in a century. The history of today’s Turkey is the history of this exceptional man. The great name of Atatürk will remain on the rocks of Ankara as an unforgetable memory of the past. On this piece of land next to us, lived a great and very powerful man. To rid the land of the enemy invasion like a thunderstorm, to abolish peace treaties with a sword flick, to demolish the Caliph’s throne and efficiency of hundreds of years like a fist, to reorganize the country, to awaken the national ambitions of the desperate people, to create a modern and civilized state… These are the miracles that have been realised by Kemal Atatürk right in front of our eyes. This is Atatürk; the ancestor of his nation. A man of sword, ideas, heart and determination. The great son of this nation is also the greatest commerade of the 20th Century. Mustafa Kemal has been the one to take away the knife from the merciless surgeons while they were cutting the Ottoman Empire into pieces. He has activated national energy and has given life to national will. He abandoned the government center that was out of control and that had no power to resist and passed to Anatolia where he began a search for the vital forces of his nation and the weaponry that he was later to use in Sakarya. Yet, the victory of the weapon was not enough. He wanted to save Turkey. He wanted to see his country developed and prosrerous. He wanted to evaluate the cultural standing of his country. He was the symbol of bravery and humanity for his nation. He started a reformist action that was as remarkable as his values. The National War of Social Reforms… The most successful and great reform was this one that had been going on for 15 years. We are going to bow in front of the great man, the high commander, exceptional reformist and statesman, that I know as your Great Chief. The death of Atatürk has aroused great sorrow in Bulgaria, as in many other parts of the world. There is no doubt that the world has lost an individual whose place cannot be filled easily. On November the 10th, the 25th death anniversary of Kemal Atatürk, the Turkish Republic will pay its respect in front of its founder’s and first president’s immortal presence. In the name of the Canadian government, I would like to state that we also respect this great statesman and wish the best for the future of the Turkish Republic. Mustafa Kemal is the heart of the new Turkey. He has managed to create a brand new and strong nation out of an old and deformed society. He enjoyed the respect of everyone and was admired for his energy. I would like to express my feelings of admiration to the Great Turkish Leader Mustafa Kemal Atatürk, the founder of Turkish Republic for his struggle and success in bringing freedom and democracy to his country on his 25th death anniversary. His life and deeds will continue to be a source of inspiration not only for Turkey but for the whole world. All Chinese people share your sorrow. Because, the death of this Great Leader of the Turks has left alone not only Turkey, but our continent and the whole world. Atatürk is the Ata (Ancestor) of the entire continent of Asia. The man who inspired the new Turkey, Atatürk, has been lost. We envy the Turks because they had such an exceptional leader. Because, we too, are in a position similar to Turkey, in which Atatürk took his part and played his role. Atatürk has created a state on the basis of the English Parliamentary model and has transformed it into a strong industrial country. In brief, Atatürk is the creator of modern Turkey. Turkey appears to be a miracle in the muslim world. Turkey will be grateful forever to Atatürk. Atatürk has left a state that is sure of its future. Atatürk has left behind a national state that has no fear of its future. Atatürk has passed away on duty while in the prime of life. However, his remains will take their place on the pages of history as the legend of bravery. He has created his masterpiece as a warrior and a statesman. Unlike most leaders keeping their ruling positions by sword, he has put away his sword after he won the victory. One should clearly understand his deeds: A demolished state, a corrupt army, a desperate nation without hope! Yet, after defeating all armies opposing him, Atatürk has dictated the national Turkish State to those he defeated at Lausanne in 1923. Atatürk had realised the fact that he had much more important missions after he had defined the borders of his state. He has left behind a westernized modern state. The understanding of wearing a hat and leaving behind the Arabic alphabet to use the new Turkish alphabet, for which he has personally teached, may be seen as ordinary things. However, these are the most important features of the new state’s policy of peace compared to the former warrior spirit of the Turks. Atatürk has solved the problems of Montreaux and Hatay, entered on an energetic reformist action, created industry and railroads. The leader of Turkey, Atatürk, has accomplished the unexpected and created a strong country out of Turkey, known as the “Sick Man”. Atatürk was the gigantic symbol of personality and talent. He was the man who created the most extraordinary occasion of the twentieth century. He transformed the semi eastern, Caliph oriented, religion powered nation into a modern, secular and national state. This meant leaving oriental and spiritual symbolic roots behind to achieve radical developments. Atatürk’s foreign policy will remain as an example in history. He made friendly aggreements to sort out foreign debts, reconstructed the channel’s matters and solved Hatay problem without entering a war. Within many reformist movements, Atatürk has gained a new standard of life to the Workers and has left behind a strong Turkey that will always follow his footsteps. Atatürk’s masterpiece will remain in history forever. The man who created the most glamorous occasion of the twentieth century. One of the most distinguished personalities of his age, perhaphs all history. Turkey would never be a great state without Atatürk. Atatürk was an extraordinary statesman, he was one of the most important personalities of post-war world history. If it weren’t for him, Turkey wouldn’t exist. The death of Great Atatürk has made Finland sorry. The Finnish people, who observe the Turkish Reforms closely, share the sorrow of the great Turkish Nation, whom they see as a brother nation coming from the same race. Atatürk is a good man with a good heart. The Turkish Nation sees itself in his personality. One can easily see the characteristics of humanity in him. If he has won the war and he is more to win, he will also make peace. Believe my words and let me tell you that he will succeed. He will do good and perfectly so, he will achieve a great success that no-one has ever achieved. Atatürk’s distinctive creativity appears when he proceeds his energetic work with delicacy even after the danger is far removed. He manages to give an irresistable attraction to every move he makes. It is impossible to explain this with logic. This is his personal talent. One of the most exceptional events of this era is the establishment of a national Turkish State while the Ottoman Empire disappears like a ghost. Mustafa Kemal has done something great. The victory of Turkish nationalism has effected Asia and Kemalism has influenced all countries fighting for freedom. He was a great man … He was a political genius. One day he told me that there are small nations depending on very strong countries. He said that the future belongs to those small nations rather than the strong countries. I kept his words in mind. Because, these words reflect the deep meaning of the success of Atatürk, who was known as the most dependable, alert and clever man of the near East before his death. At this moment, I share the deep sorrow of Turkey because of the loss of the great nationalist and great statesman who devoted all his life to the freedom of his country. His mission, both within blood and peace, will pass to all nations that are in sincere relation with the Turkish Nation. The French Nation feels sorrow for this loss that the Turkish Republic faces today. Kemal Atatürk is an idealist. The reason he has managed to do great things is, he has always kept principles and has managed to limit his passion. He was one of the greatest men of the era. The Turks, known as the most loyal nation, will never forget that Atatürk was the deliverer of his country. The great man that stood in front of me was some mysterious talent and character that I had explored, there was no doubt in his words. Old Turkey had been under domain for centuries, yet, it awakened with his efforts and glamoured with his reforms. Turks of today have reached their position that had frightened Europe centuries ago. The Turkey that waits in silence with his death is a strong and ripened Turkey. He had sharp looks that sparkled suddenly. His strong character and his speed of understanding shows itself in the movement of his hands. The bright tone of his voice shone like the steel. Mustafa Kemal is really a young, neat man believing that was born to rule his nation. The masterpiece he has created in wisdom and peace will leave its trace in the histories of the peoples. He has won all the ranks of a country in which he has abolished every rank. The most honourable name that could ever be given to someone in his country was given to him. Kemalism invented the fast path to development and has proved that even with one generation of disciplinary education, a great populist civilization can be developed.This can be proposed to mankind as an experimental example of philosophy. Kemalism has terminated things that could normally be achieved only in centuries. Atatürk has died. The east column of the peace temple went down. No one can guarantee peace in the universe anymore. The European statesmen did not listen to his warnings and advice in 1930 and lead the world to disaster in the second great war in 1939. He had closed his steel blue eyes to the beautiful light of nature, he was supernatural. Figaro, Paris Atatürk has managed to create the miracle to immortalize a nation in a couple of years. He was a revolutionary and a rebel at first, then he became “the father of the Turks” as a victorious commander and created the New Turkey. He cast out the Sultans, gave freedom to women and realised a radical reform in his country. Just a glance from the Father of the Turks will be enough to his loyal nation. It can clearly be said that the world of Islam was to wait for at least another fifty years. Thousands of Arabs that gathered in Jerusalem are shouting “Long Live Mustafa Kemal Pasha” to the heavens bravely although there are machine guns located at minarets and towers and there are English soldiers in armed vehicles surrounding them. Mustafa Kemal walked a few steps. The commander of the 19th Division stayed put for about a minute between the two armies. Then, slowly he began raising his right arm and walked towards the enemy front. The Turkish Infantry leaped out of their positions shouting “Allah, Allah”. They managed to defeat two English Battalions. North Lancashire Battalion was in a shock and was forced to retreat. Wiltshire Battalion died under bayonets. The Turks came down the slope in an irresistable attack. They threw the enemy, including the New Zeland soldiers, to the sea. Young Turkey has accompanied Europe with her interest in and attention to science. There is not one thing missing to force us to salute him in the name of civilization. You can not appreciate him enough. You can not value his greatness. He resembles a giant mountain. Those living next to it can not realise how great it is. One has to look at it from a far distance inorder to understand its greatness. This revolution belongs to Mustafa Kemal, an extraordinary distinctive man. I have lived around him for five years and had the chance to gain his friendship. I used to notice that Atatürk was sometimes happy, talkative, anxious and always far from desires and assumptions… When I got in, he was on foot. He wore a nice suit. I talked. When he realised that I had memorized the things I was saying, he left the paper he was holding and answered me in Turkish instantly. His personality was attractive, like magic. He used to gaze far away and the moment they were locked on you, his eyes would calm down. He was blond, his hair framed a determined forehead. He had a strong, muscular body that resisted the heat of the deserts and the glaciers of the high mountains. He had broad shoulders that could carry all sorts of responsibilities. He was born to accept victory. I would like to express the feelings of loyal friendship of the French Nation to the Turkish Nation on the 25th Anniversary of the death of Great Atatürk. Today, Turkish history is linked to the Western and European history. The efforts of Atatürk have made this possible. The friendship of our countries for centuries is one of the basic characteristics of this improvement. Whenever we read about the life of an important diplomat or a great commander in history, we take pleasure of imagining his face, words or his impressions and we say, “How I wish I knew him”. - As you see I have lots of victories. Still, I feel the pain and sorrow for the soldiers who died on the battlefield every night. Because of the heart he has, apart from his courage and sharp mind, the miracle he has created for his country is never surprising. Simply, a man passed by. A man of middle height, walking ordinarily, yet, with sharp eyes with sharp looks. His name was Mustafa Kemal. He was not a simple dictator aspiring to personal fame and fortune, he was a hero who tried to maintain a strong base for coming generations. On 10th November, all the world remembers the life and deeds of a human being, whom Germany is bound to in friendship, respect and appreciation. As a soldier, Atatürk Victoriously succeeded in an enormous and sometimes desperate battle and then he took the responsibility of the State. The declaration of the Turkish Republic on 29th October 1923 is the result of his genius in diplomacy. Some traditions and customs of the past that opposed the democratic development of the Turkish State needed to be altered and demolished. He had brave and corageous ideals and he began realising them with great creativity. Atatürk has created a strong, traditional and a sincere relationship with the Germans depending on trust. Atatürk has passed away leaving Turkey with no enemies. This is something no leader has been able to do. The life of the Great Deliverer Atatürk that Turkey respects without limit, can never be understood and appreciated any better than in Germany. Because Germany has tread the same path. The peace agreement forced on Turkey took take away the vital parts of territory. However, the national hero Atatürk managed to save his country and put through a nationalistic vision. He chose to fight for independence when he saw that it was not possible to save the country with interviews and Geneva methods. Only a will as strong as steel and immense power could have succded at that stage. His deeds at home inside are none the less appreciatable. Germany adores Atatürk’s example and struggle. Germany sees a great personality in him that should be a symbol for all countries that respect freedom. Those who desire to recreate peace in a world that suffers in pain and those who long to achieve wisdom as well as material development should be inspired by Atatürk’s directives and power. Today, Kemal Atatürk may look at what he has created and regard himself as successful. Because Atatürk, apart from everything else, has brought a happiness to the Turkish Nation that it had never been experienced before. Mr. Mustafa Kemal was a born leader that never feared responsibility. On the morning of 25th April, he decided to attack the enemy with his 19th Division. He took his men ashore and, incredibly, resisted the attacks for three months. I will always depend on his determination. His historical greatness can be understood by looking at the new Turkey. This great statesman and leader of the people has given a spirit even to the villages far away in the Anatolian mountains with his determination as strong as steel and his vision. A great soldier, a genius statesman and a historical personality has been lost. If todays Turkey has gone further compared to any country of Europe after the World War, one should find the reasons in the personality of the genius President of the new Republic. Atatürk is not only the creator of a new Turkey, but also the teacher and the instructor of his nation. Atatürk will always have a special place among the war leaders of the world that change their nations with their strong personality. He has been the creator and the founder of a new Turkey. This is the man who established the new face of near East. The East faces a new page of history written by Kemal Atatürk. History tells us how the (Barbarian) Turks spread out from the plateau of the Altaic Mountains to the east and to the west to demolish nations and their cultures. In the Bible and in the Middle Age sources, Turks (Gogve Magog) have been described as extraordinary and horrible ghosts. They were a fireball within the ice of a frozen civilization and the Turkish scent is still perceived in half the organs of the world. Nowadays, modern science finds the lost traces of old nations that lived on earth thousands of years ago. We find the Turkish race in the bright pages of history,creating a bridge between the east and the west by creating new states and forming new cultures. Many scientists in Europe refuse to recognize this fact. However, Atatürk’s life, the awekening of the Turkish nation and their developing a new national spirit clearly shows us that the 20th century is not the first time that a state has been created by them. In the personality of Kemal Atatürk, a brave spirit rises to the light and this spirit shows the path to freedom and salvation to the nations that are captured by others in other parts of the world. His personality has virtually been legend from the shores of the Nile to the old China seas. Still, he is at the center of his nation. With the help of his eternal youth, huge determination and power, this man of wisdom and faith enables the world to watch a miracle of a man in sincerety towards his nation and to the world. Although it was presumed to be a great defeat, The Turkish Nation has delivered a great struggle and gained its independence. The nations owes a bow of respect to him. We Germans owe the Turks the example of tearing apart and casting away the decisions of the victors’ diplomacy. Mustafa Kemal and his nation had no weapons and they were in a very desperate situation, however, they entered a struggle to open a new era in history and they showed all the world how spiritual power is stronger than any weapon on earth. What makes Mustafa Kemal superior to other high officers is his scorn of death and being the greatest example to his soldiers in terms of bravery. He is a man who won his nation’s right of freedom in battle while it was sentenced to captivity, he is a man who tore the death sentence for his nation and threw it to the faces of his enemies. Atatürk is an eternal symbol for all nations who feel freedom within themselves. It is only natural that the two nations are in grief because of the death of the Turkish Chief. Our friend Turkey is preparing to pay its final respect to its founder and creator. Before his death, Atatürk has finished his task to create a strong, young and hard working Turkey that is admired and respected by everyone. Each country will make statues of great men that brought victory, well being and happiness to their nation. However, Turkey will have to excavate and look for a distinguished stone in the mountains to carve Atatürk’s statue. Because Turkey had the previlage to have such a distincted leader that all the world looked on in envy and admiration. The death of this great man is not only a loss for Turkey, but for the whole civilized world. Atatürk was in search for the roots of the Turks. Turks have always been influenced by the positive or negative theories of foreign historians. Kemal Atatürk has given the Turkish Nation a rank of nobility that all countries in the world would envy. For the forthcoming generations, only his era would be enough for them to be proud of their past. We, the Royal Government, the Hellenic Nation and I personally share the national mourning of our friend and ally Turkey. Greece has decided to show its deepest sympathy to this noble and friendly nation in their most difficult time. While remembering the Great Chief, the brave soldier and the creator of Turkey in respect, Greece will never forget the fact that President Kemal Atatürk has been the founder of Turkish-Greek peace and cooperation. Greece will always keep the meaningful memory of the Great Deliverer that changed the fate of the noble Turkish Nation. “Atatürk’s only feature and fame is not his shiny sword. Things he did in peace expressed the strength of his determination and the brilliance of his ideas. A development such this great has not been achieved since the time of Peter the Great. Atatürk has managed to create a young, strong and determined Turkey that knows where to go in only 16 years. No one has ever done what Atatürk has done in Turkey anywhere. Neither Cavour, nor Cromwell, nor Washington… No one has done what he has done and no one has found what he has found. The new generation that he created according to his principles will surely continue in his path. Plutarque has written the biographies of many heros in history. He believes the greatest success and happiness a man can ever reach in life is to be remembered by other nations of the world in respect and mourning at the time of death and he states that this has been achieved by only a few men in ancient history. Had Atatürk lived before the time of Plutarque, we would definitely be among those happy people. The Turkish Nation has cried for the days for Atatürk like a real father who had given life or actually given back life. Being loved and mourned after this much is an exception in the nations’ history of the world. Kemal Atatürk is the man who made Turkey a modern Republic with his vision, courage and political, social and economic reforms. Again, he is the man who prepared the understructure of the modern economy of Turkey that can level with the European Common Market. He has been a good example to others with his personality, responsibility and courage. I have observed that most of your citizens own these features. Atatürk and his friends have prepared the basis of the reputation that Turkey has gained today. As Kemal Atatürk had said, the Turkish Nation is ready and determined to walk on the way of civilization continously without any fear. I would like to add that this development is growing in the economic power and wealth of the country as well. Budapest, 20.00 hrs. Hungarian News Agency Announcement: Prime Minister Imredi has ordered that Monday, 21th November, which is the burrial ceremony day for Atatürk, is to be a national mourning day and all official buildings throughout the country are to raise black flags. Ministry of Defence and the Mayor of Budapest have also decided accordingly and all military buildings and the buildings of the municipality are to be black-flagged. The mayor also called for the people to put black flags on the windows of their homes. The chief of the new Turkish Nation holds a distinguished place among the modern statesmen. His mission was the most critical one and he has been azamingly successful. This success has been achieved by his character of steel and irresistable determination. His death cannot be called the fall of Turkey because the young generation is eager to continue on the road their chief has opened for them. The world should feel the poorer for the death of this great man and hero of both at war and at peace. The world has felt the poorer for the death of this great man and hero of both at war and at peace periods. It is Atatürk who broke the chains of the victors of the war with his Power, determination and courage. Atatürk’s country gained everything suddenly whatever revolutions and reforms can give, whereas this takes a long time in the west. He has left so many deep traces in Turkish life that this is an achievement that can be witnessed in the west in a century. I resemble Turkey as a bee hive and all the Turks as bees looking for honey. Turkish nation has gathered around Mustafa Kemal today, just like the bees gathering and working around the queen bee. Kemal Atatürk was my hero in my youth. We were dealing with our own independance movement at the time. Me and my friends were imprisoned. We were in jail, watching Kemal Pasha’s struggle to save Turkey from foreign dominion. I can never forget our celebration and happiness in jail when we heard about his great victory. Later, we read about his reforms. At those times it was impossible for us to comprehend those reforms. I highly appreciated the moves of Kemal Pasha. His dynamism and potential was to be highly admired. I wanted so much to visit him, however I didn’t have the chance. I’m really sorry for that. He is one of those who created the modern era in the East. I will keep being one of his greatest admirers. Kemal Atatürk has been more constructive and creative than all the personalities of power balances within Europe that were created by the war. His great success in military saved his country from the rule of foreign powers. After many defeats, his talented diplomacy won Turkey an important international reputation in Europe. He managed to save his country from disgrace and coped with all sorts of threats and dangers. Contrary to other dictators or leaders, Kemal Atatürk did not force people in relation with him to accept his political and social views. He always wanted to review his reformist plan with his people. He believed that this was the only way to be successful and he tried his best to convince the Turkish people. Kemal Atatürk disliked two things, being proud of himself and being threatened. He fought unforgivingly with the enemies of the Republic. After the State was secure from possible enemy threats, he prepared a democratic basis for the citizens of his country for more freedom and opportunities. He was always against totalitarian party mechanisms. Under his rule, Turkey became a strong constitutional Republican, democratic country. Speeches were given and poems were read for Atatürk at the National Assembly of India and everyone cried for him. east, Japan has managed to arrange its sources according to the necessities of the new age and has achieved a reputation among the top countries on the world. It is a shame that its acts of arrogance will bring its end and from now on, it is impossible to take it as the possible deliverer of Asia’s reputation. While we had turned our faces to the reborn Turkey as a hope, we heard the bitter news about Kemal’s death. Before Kemal appeared on the scene and reminded us about the victorious past of Asia, Turkey was seen as a Sick Man in Europe. His deeds have given us a new hope of life in the east and that is why we highly admire Kemal’s spirit. His death is a great loss for Turkey, as well as for the whole world. Kemal Pasha’s bravery is not only on the battlefield. He has leaded a tough war against the treachery of ignorance, perhaphs the most difficult war a nation can ever face. He was a great deliverer of his people. He should be a great example for us. His inspiring success has placed him easily in the Milky Way of the immortals where every generation will respect him forever. He was one of the greatest men the world has ever seen. Atatürk was the leader of the Turkish Nation as well as all other nations of the world fighting for independence. You have reached independence under his directives. We have reached independence walking in his path as well. He was not only the great chief of his brave nation. He was also one of the greatest sons of humanity. Those like Atatürk are not born for a generation or a limited period of time. They are men who will be the leaders of their nations for centuries. The deep mourning of the brave and noble Turkish Nation has reached its peak today. Because today, the Turkish Nation is to take its most honoured and most distinctive child to his grave. Sounds of crying and mourning are to rise today from beautiful Ankara. The Turkish Nation today is under a great distress because they have to be apart from their chief who had lead them and inspired them in every way. Atatürk was not only the great chief of his brave nation. He was also one of the greatest sons of humanity. The mission of the committees representing millions of people that attend to the burrial ceremony of Atatürk is to express the feelings of sorrow and pain that people feel for this irrecoverable damage. Such ingenious men never die. Because their deeds that have been carved deep into the Conciousness of their nations will make them live forever. Such men are not born for a generation or for a limited period of time. They will dominate the histories of their nations for centuries by letting them use the endless source they have created. The Royal Palace, the Shah and the government have announced mourning for a month because of Atatürk’s death. His Majesty the Shah has ordered to lower the flags in all military and official buildings of Iran and the embassies of Iran in other countries till the end of the burrial ceremony. The Shah’s decision has been announced in all papers of the country today. Naming General Mustafa Kemal as Atatürk shows us the respect his nation feels for him. After the Ottoman Empire lost the 1st World War, he managed to fight and save the honour of his country and succeeded in bringning his country to a new development phase. It is quite natural that Atatürk’s life is emphasized whenever one mentions the history of the 20th century because he is one of the best examples of brave soldiers who are always ready and willing to transform defeat into victory, to change the situation of a collapsing country to an evaluation phase in their feelings of discipline and responsibility. Although the master plan of Atatürk aims to westernize Modern Turkey, his efforts to bring his country to the level where it can meet the requirements of the political status of the century, his efforts to develop his country in economic, social and cultural fields are realities that can never be denied. The world has lost one of the most interesting men of our time. He has won victories against his enemies with his extraordinary determination, limitless courage and distinctive, sharp mind. His wisdom and authority has enabled him to achieve a perfect victory in three years not only in the military sense but also politically. In the struggle with the French, with his wide vision and understanding, he has forced them to cease weapons and return to Marseille although they had the intention to invade Killikia and had other ambitions in Asia. The war Mustafa Kemal prepared and conducted in Anatolia has become a great success with the trust and belief he created among his nation. All the world admired this. Mustafa Kemal’s brilliant war strategies, indestructable determination and desire ruled the war from its beginning till its end. Atatürk has given back its historical values to a country that had collapsed. That is why he should always be remembered as one of the most corageuos reformers of modern times. The Italian Nation shares the sorrow of its friend, the Turkish Nation for the death of its Great Chief. With the death of Atatürk, a very strong personality that created the development of the Near East has been lost. The Italian Nation sends its best wishes to the Turkish Republic in this very painful day. An amazing and an attractive person. Great as a soldier, yet even greater as a statesman. The greatest leader Asia Minor has created in a century. The reality that tore apart the traditions of the Turkish foreign and domestic policies after the establishment of the Republic were the traces of his genius. At the time Atatürk passed away, the main target of Turkish foreign policy was to keep peace around the Near East, the Balkans and the Western Asia and to improve the mutual understanding among the countries of the region. This ideal will keep Turkey from getting into one of the “ideological fronts” of Europe that threathen the continent seriously. On the death anniversary of Mustafa Kemal Atatürk, the founder and the first President of Modern Turkey, I would like to pay my respect to this great leader of mankind and send my sincere greetings to the Turkish Nation. Atatürk is very well known in Japan. He has saved Turkey from the disasters after the First World War and has been a hero by winning a great victory. He is a great statesman who has created a new Turkish Republic from the ruins of the Ottoman Empire. We have admired Atatürk’s reformist deeds, especially those concerning the Turkish Language. “Great Men lead their generation. The great genius of the Turkish Nation, Atatürk, was a great political and military personality and a great nationalist. He united his country with the help of his soldiers that gathered round him and he worked miracles and won victories for his nation that always lived with hope. Atatürk will always live as a symbol of patriots who are deliverers of their nations. The Turkish Nation remembers its Great Father in respect. May it be well known that his name will always be remembered in understanding and admiration as the brave and devoted Father of the Turkish Nation. Atatürk was literally a founder and creator. He has drawn new borders for his country on the world’s map and has found all the necessary sources to feed it. He has obtained weapons to protect his country and he has obtained a language and an alphabet for his nation. All this was completed successfully from 1923 to 1938. He defended his country against foreign threats. Those foreigners had been victorious in the war and they were capable of doing whatever they wished. Everyone should clearly understand that this great guide who has closed his eyes forever in a palace room by the İstanbul strait will always remain as a miracle in the pages of history. It is very difficult to define the life of this man whose death has affected the world deeply. Atatürk was one of the most exceptional geniuses the world has ever seen. He has changed the course of history. We bow with respect in the immortal presence of the most honoured dictator of the world and send our condolences to the Turkish Nation that is suffering its worst sorrow. Mustafa Kemal, who cast out the Sultans, tore apart armies has died. He was the hero of the Dardanelles and the creative mind of Sakarya. He had created Turkey out of nothing, he gave them freedom, he provided honour for his nation. The greatest enemy of evil and the creator of Kemalism has died. Every head bowed whenever his name was mentioned, yet, he has died. Our hearts tremble with this great pain. Atatürk’s death is a great loss not only for Turkey, but also for most of the eastern nations that need such adeliverer. The most exceptional genius the world has ever seen. He has changed the course of world history. Atatürk will remain as one of the greatest men of his nation in history. Turkey has recovered and has the opportunity to continue on the path Atatürk has taken them in a more powerful manner. Atatürk has reconstructed Turkey. He has left behind a state that will go on with its path in a confident manner. Kemal Atatürk is not only one of the greatest men of this century. We, in Pakistan, see him as one of the greatest men of all times. Mustafa Kemal was a military genius, a born leader and a great patriot and he managed to take Turkey to greatness again. He was not only your nation’s dear leader. All the muslim world watched him in love and respect. He was one of the few in the muslim world that made a brave step towards awakening in terms of politic scope. On this mournful day, we would like to share your deep love and respect to this great founder of your nation. We were like a fading sparkle when our eyes met his and we turned out to be a sun to enlighten the world. I have heard about the death of Mustafa Kemal, the President of the Turkish Republic, in deep sorrow. I would like my sincere condolences to be accepted. Atatürk has created Turkey with his sword and organized it with his ingenious ideas. There is no field that his creative spirit and strong nationalistic feelings are missing. He was the first to understand that the worst for old Turkey was the Sultan’s regime to let foreigners get involved in interior affairs in the Ottoman Empire. Atatürk has saved Turkey from being divided and demolished. Today, Turkey has got plenty of friendly countries both around it and in Europe. By his glamorous spirit in reforms, politics, economics and all other aspects, he has won the admiration of the world and added the most honoured period of time to Turkey’s history. The starting date of this reorganization is 1923, which is the date for the Lausanne Treaty. Poland, being in traditional relation with Turkey for 150 years, was the first country to sign this aggreement. The Turkish Nation has got national pride and it is only natural for it to embrace its father Atatürk with a sincere love. Turkey has recently been a country to be taken into consideration in the international arena. The modernization and renovation movement of Turkey continues. The Sick Man of the Ottomans has recovered. Its development and energy is fine. Atatürk has really created a miracle. Turkey has taken the key role in the near east again under the rule of Atatürk. A long way has been completed, a masterpiece has been created and many victories have been witnessed. All these belong to Atatürk. It is only natural that the Turkish Nation, well known for its national pride, embraces its father, Atatürk, with sincere love. Atatürk will take his place in history as an ingenious organizer, a miracle in administration and the saver of his country. Atatürk used to understand the real needs of the nation. He had accepted the criteria of a regional development policy instead of the former Sultan’s policy of exterior expansion. Sultan Mehmet. Atatürk, as mentioned in the name itself, has literally been the father of the Turks. A rather though father, yet the father who has arranged today’s well-being. His deeds can be a subject of pleasure and well-being for all the world. We share the sorrow of the Turkish Nation with all our heart for the death of their Great Chief and leader. Atatürk is one of the greatest leaders of the world who has saved and elevated his nation from disaster with his determination. Our nation bows in sorrow and respect for the death of the greatest Turk. All schools were closed when the news arrived in Romania that Atatürk was dead. Atatürk will take his place in history as an genius organizer, a miracle in administration and the deliverer of his country. This reformer who rose over ordinary humans was most humane with his character and life-style. Originally, these are the reasons of the attraction to his personality and his authority, which he has managed to keep till the end of his life. Atatürk has opened a new era in the world. I can never forget how he gave a lesson to the west by giving the rights of the women and expressing the importance of mothers in his country. Our nation knows the name Kemal Atatürk very well because of his efforts to give his nation freedom and his struggle for national development. Atatürk has awakened the Turkish Nation to fight with the imperialists. The first Republic of the near and middle east owes its birth to him. This Republic has been an example to many national independence movements in many countries. Atatürk believed that his fight against imperialism was a holy war and he gained the admiration of the Turkish Nation as well as the whole world. Atatürk has done much to save Turkey from lagging back a century. The reforms he had made aimed to develop economic life, industry and agriculture. In the time of Atatürk, Turkey’s international authority has grown and Turkey began to play an important role in world politics. Atatürk has been the creator and the pioneer of many reforms, such as, the declaration of the Republic, establishment of the national banks and national industry, construction of railroads, expropriation of foreign investments, seperation of religious and governmental issues, use of the Latin alphabet, acception of the women’s rights and the deletion of ranks. The independence movement of the new Turkey depended totally on Kemal Atatürk and his death is a great loss for the Turkish Nation. All sincere friends of independent Turkey feel sorrow for the loss of this great man. His name is directly related with the national independence war and the reorganization of Turkey in the political field. Kemal Atatürk’s death is a great loss for the Turkish Nation as well as all the friends of Turkey. Being one of the sincere friends of Turkey, the Soviet Union is in deep sorrow because of the death of this unique statesman. The death of Atatürk has put all the Turkish Nation in deep sorrow. People who are sensitive about the independence and freedom of their countries are also sad. Friends of independent Turkey, the Soviet Union and all other countries that are in development, surely share the deep mourning of the Turkish Nation. His death is a big loss for the world as well. The late President’s reputation was worldwide. Everyone loved and respected him because of his fight to gain the independence of the Turkish Nation. He has strengthened the new national structure of his country. The military genius and a stateman’s philosophic genius were collected in Atatürk. The Turks will emulate his magnificent efforts and improve their reputation. The world has never witnessed such an exciting spectre as Turkey’s reestablishment in western esteem. If it weren’t for him, Modern Turkey would never exist. The Turks will emulate his magnificent deeds and they will improve their existing reputation even more. Turkey’s reestablishment and organization has been a life-giving reform. Today, Turkey is devoted to the strong personality of Atatürk. The last victory achieved with the final Ottoman Emperor’s leaving the country on November 1922 has been saluted with great eagerness and anxiety in the east. The actions taken afterwards, the strong decisions and the swift practice has amazed all the world. Kemal Atatürk saved his country from being torn apart completely and created a strong, modern and a national state. Atatürk has broken tha chain of the invaders. At the stage of his death, Turkey has such an important role around the İstanbul Strait and Near East region that all the great states turn their faces to Ankara. It can clearly be seen that Atatürk, the great chief, during his 14 years period ruling the Turkish Nation, has managed to do things that have never been done in the past centuries. The Turks will follow him and they will enhance the existing reputation of their country in the world. The remainings and the deeds of Atatürk, the creator of Modern Turkey is well known in Sweden. We have admired the development of Turkey under the leadership of Atatürk. Turkey has been placed on a very strong basis after many difficult reforms created and realised by Atatürk. Under the rule of Atatürk, Turkey has been a modern state in the western standard. The reputation of this state keeps growing today. The reformist movement has changed the country completely. Turkey has achieved great success in foreign politics under the rule of Atatürk. Atatürk is definitely the most interesting dictator of the post war period. First he saved the status of Turkey as an independent country. Then, he has created a new Turkish state and placed a new legislation, a new culture and a new aim to aspire to. There are many types of dictators. Some of them prefer to kill freedom and some prefer to give freedom and culture to the nation. Atatürk’s Turkey is a typical example for the latter. The world has never experienced such an exciting development as Turkey’s reestablishment as a westernized country. He was not only a soldier but a genius that we may not be able to see again in this century. Mankind mourns because of his death. My deep condolences to the Turkish students. He did not ask for a throne from his people after he managed to save his country from almost certain disaster. He was a great human being, a genius, a brave soldier and a distinguished statesman. He devoted his life to the happiness of his nation and passed away too young. Syrians share the great sorrow the Turkish Nation feels because of the death of Atatürk, the founder of Turkey and the creator of Turkish power and greatness. While our sister nation is in pain, the only thing we can do is to follow this great man’s path. The deeds of Atatürk are wonderful miracles. The reforms he has made in a couple of years in his country would normally take a couple of centuries. Atatürk is a miracle of mankind for all the times in history. Today, the Tunisian nation is in union with the noble Turkish nation, whom we are tied throughout centuries as sister countries, around the thought of commemorating in respect the unforgetable memory of Mustafa Kemal. Our nation’s admiration towards him begins in the battlefield where he has proven all the world what a great soldier he is. Today, we are remembering a great man God must have chosen to save his nation, who refused to accept defeat and give up hope. He has managed to unite the power of his nation and pumped infused his people with courage. Pushing fate, he managed to regain the unity of his country and has reached a point from which to achieve independence and freedom for his nation. Thus, Atatürk has shown all the world what a nation that prefers death to slavery can do. This example can never be forgotten. We respect the personality of Atatürk, who is the creator of independence of the country. He has managed to achieve this from the ashes of a dying Empire. His immortal masterpiece will be a flashing example and a source of inspiration for the ones who try to dominate nations that have gained their independence. Mustafa Kemâl Atatürk always knew where to stop. This was one of his virtues I admired very much. Always thinking ahead, always being careful, these have won success for his work on the road of the country. Atatürk, loving you is national worship. Steps brisk and in accord, a fine hand ornamented with long, slim fingers indicating an elegant and sensitive soul. Large shoulders created so that room remains for his generous heart, a head situated harmoniously on them. A superior man, always kind, laughing, joking and living everywhere without loosing anything of his grandiosity. Recommend Mustafa Kemal for the Ministry of Military Affairs. He should come to the Military Affaires. There is nobody else who can gather the army. Atatürk is the main architect and the pure owner of the foundation of contemporary thinking and the democratic order. Atatürk with a moderate and erect, slightly longer than medium height on which large shoulders and a chest are situated carries the stature of a statue. This imposing statue is governed by a really unique head with golden hair, sky-blue eyes which look as if piercing the soul of everything and a powerful face giving the impression to be made of bronze. It is apparent that this head is not only Mustafa Kemâl’s, but the head of all Turks. And the intelligence and the will-power of the nation have gathered there. Lips closing tightly, a chin of a sound and sharp condition releases the meaning of will in this unique face. A ringing of a bell from far away and from the depths can be heard in his voice. He talks right, he talks well. His words lack troublesomeness, are open, and it is impossible not to sense that he sees everything in its crystalline transparency and thinks that way. While asking and explaining, he speaks his thoughts after his questions. If you think wrongly, you’ll correct this by yourself while talking to him. Because his words, without letting you feel it, give you a new and right opinion. When you pay attention, you feel that the question regarding the matter touches the most critical aspect of it. After having listened to him talking about different subjects and matters, you begin to believe that this unique hero, who sensed the future of the Dardanelles from the Anafartalar, and the liberation of Izmir and Turkiye from Dumlupinar, is not only a great soldier. Each feat, each necessity of the nation, of the country, each matter of civilization, the age and the world cannot escape his powerful view. There are some famous people, whose fame has emerged from events and coincidences. When you talk to them you feel that the great man in your dream slowly begins to shrink. However in the presence of great Atatürk, the creator of events, victories and reforms one gains an unequaled power of heart. Seeing the virtues of the Turkish people and creating miracles of them in the most impossible of times, certainly would indicate a unique power. But, depending on a power and genius higher than the weak and deficient powers of the nation and country, the people gained these two attributes, one higher than the other, only out of Atatürk. Creation has many beauties and many greatnesses. However, doubtlessly a perfect man is higher than all beauties and greatnesses. In order to believe this from the heart, a moment of being together with Atatürk is sufficient. Atatürk has always been the defender of positive thought, modern civilization, human rights, democracy, social state of law, the leader of nations longing for freedom, the ruthless enemy of imperialism, of the violators of human rights. Atatürk, great Turk, great man. He not only taught us to fight, but to love. Therefore are we one and united. This man, who made the whole world accept his genius, should have genial thoughts on each subject. I am not able to know these thoughts in advance. Ataturk knew very well to take necessary precautions when needed. However, I would like to tell the people: the sentence which enraged Atatürk most was “underdeveloped country”. With his words of “Peace in the country, peace in the world” Atatürk has become the greatest civilizor and the peacemaker of humanity. However if we only slightly examine the causes which Atatürk followed in his lifetime, it will be possible to find there the answers to your questions. 1- Atatürk continuously made efforts to westernize. Of course, if he had lived we would walk on the same road. 2- If he had lived, no country or state could demand lands from us. He would violently reject such a demand. For him, if needed, agreements with a foreign state had to be made wholly mutually. If he had lived this his habit would have continued also. 3- He determined the politics of life with his reforms based and laicism. If he had lived it is only natural that this politics would have continued also. The development of the villagers, whom he called the masters of the country and the villages was the one of the basics of these policies. K. ATATÜRK, the victorious commander of the battlefield, the ardent defender on the tables of peace, lover of freedom and independence; the ardent supporter of democracy, national sovereignty and national dominance, has shown the target of the youth he has entrusted the Republic to found modern Turkey enlightened by science and technology. 1- The place Western civilizor Ataturk was going to take “after the blocking of the Second World War” would doubtlessly have been in the front of democracy. Anyhow, the direction he gave our politics as soon as he won the victory over the Allied Powers showed this apparently. Our friendly relationships with England and America began from that period. 2- Accordingly, Atatürk would never have hesitated to approve and accept both the Three-Party Agreement made with the English and French at the beginning of the Second World War and the Turkish-American alliance (on the condition of binding to more sound basics as for our national interests) after the War. 3- If Ataturk had lived, our inner politics today would not have fallen into the weakness which has paved the way to the tumult of today. 1- Without any moment of hesitation he would prefer the front of freedom. Ataturk was a supporter of interdependence. During his lifetime he continued his foreign policy on the interdependence with the States of the Balkan and the Sadabat Pact. 2- He would ally with America. This alliance is different, two party agreements are different. Doubtlessly America has rescued Turkey out of the paws of Russia. 3- In domestic politics he would fight fiercely with reaction and communism. He would embrace the constitutional regime of today. Kemalism, which is the philosophy of life of Ataturk and consequently of the Turkish Nation and youth, is based on the absolute superiority of national will and that national sovereignty is owned unconditionally by the nation. 1- Of course Ataturk would choose the Western freedom front. After all, during his lifetime he had proved that he approached the West. The evidence are the Alliance of the Balkan and the Sadabat Pact. Always taking the West as his model Ataturk has thought to pull the Turkish Nation to the level of western civilization and even above it. This great man has taught the Turk that he is a Turk and implanted the nation to be proud of itself. 2- If he had lived, could Russia demand bases and three provinces back? This is a question for thought. Because, before Ataturk, who enchanted the whole world with his authority, the attitudes of the foreign states could be different. In our age all nations are supporting and assisting each other. Of course we cannot be alone and only outside of these unions. Therefore, I think that Ataturk would ally with America. 3- As for his domestic politics of today, Ataturk wished peace and tranquility, which he wished also to give the nation. In order to establish peace in the country, he would abstain from nothing. He behaved harsh, or soft, as the conditions asked for. Having heard the Kubilay event, he immediately went from Edirne to Menemen and punished the guilty. 1- Our politics are known. Remaining neutral/impartial. Friends with the right wing, friends with the left wing. If one of these friends provokes us against the other, we could say to him: Do not exaggerate, we can unite with the other and beat you. Thus, our main problem was to remain impartial within freedom. 2- I don’t see myself authorized to answer your question. Because Ataturk was such a genius, he knew how to act according to the base and time. Therefore, he would act as he deemed necessary for the interests of the fatherland. 3- In domestic politics, Ataturk has always been progressive. As far as I know he would not make concessions on his reforms. At a time the independence and freedom of the Turks were about to fall into darkness, Mustafa Kemal rose like a sun in the horizon of Anatolia and drowned this darkness with his light. He brought the daylight the Turkish nation was waiting for, fallen into darkness and suffering. He showed the way of liberation. He wrote the epic of the Turkish War of Liberation. He brought the yearning his nation waited for. Some “outer appearance” stories have been told about Ataturk. One could not look directly into his eyes. An ambassador got so much excited meeting him that his feet slipped and he fell down. “Of course you know who he is? But you can’t understand him: he is ours. Don’t you know, can he be represented with these hands? Let on his chest appear the size of a nation. There is a painting of Ataturk in soldier’s uniform, the body is long and large, but the head is small. This measurelessness is explained with a story. The painter asks Ataturk how he should make the height, Ataturk points to a soldier standing away; says to take model of the height of this soldier. We do not know whether this story is real, or not. What we know is that the painter has been deceived by his desire to paint him huge. Mithat Cemal Kuntay asks the sculptor to show the man who carries the fatherland on his back with a strong body such as that of mythical Atlas. In the photographs taken in 1919, when Ataturk had begun the War of Liberation, we see a man who remains frail among the pale faced, slim sized, tall friends. Here, this man has completed the gigantic feats. It’s true, we cannot abstract from his blonde hair, blue eyes, his body which is an image of subtlety. However, Ataturk is all above a “thought”. A thought has liberated this land, a thought has reprocessed and re-founded it. They say the sculptor has thought over the stone. Actually, the human bodies and the human faces engraved in the stone are nothing else than the thought of the sculptor. The body of Ataturk, which all of us wish to see in a different aspect, to imagine in different views, is now dust. Above him a great monument rises. However, the thoughts of Ataturk still exist. Furthermore they are fresh. These thoughts were spoken thinking of the future. In these thoughts the youth, the security and the illuminated future of a country are included. Ataturk lived within the Turkish Nation, knew deeply all its existence. During his lifetime he has processed the philosophy of life for his beloved nation and has spoken of this philosophy in his speeches and conversations. All these are now waiting in books. We will find Ataturk in these speeches, conversations. If not for his appearance, his body we imagine to be a mountain, he is in them with his thoughts sublime like skies. He shines in them like the sun of thought. Ataturk is both the greatest hero and the chief author of the epic of the Turkish independence and freedom. Ataturk was the symbol of Turkish rhetoric. His speeches have been the light of darkest days. Beginning the national struggle, he described the belief he felt to his nation with the most eloquent words. He was a genius commander, great reformer, unique politician. If a man in addition to one of this characteristics furthermore is an orator, success is half-achieved. He talks for hours, rolls like a cannon, babbles like a waterfall, flashes like lightning. His magic voice addressed the soul, his elegant gestures carried away his audience. Speaking, his intelligent eyes lit up, his sweet face grew and it felt as if the speaker was not a man, but the history of reforms. Beginning the revolution he gathered the nation around himself through his statements and speeches. In the historical First Grand National Assembly he was the most heroic orator of secret and open sessions. When he spoke the wavy sea calmed down. When he cried out, the calm air tempested. In his journeys as President there was another manner and another magic in his speeches to the nation. The history of rhetorics shall say he was an orator who was been listened to for hours. The speeches of Ataturk are a page in our history of reforms., the coming generation will learn by heart his speech to the youth with love and they will maintain his sacred trust as the guardian of the state he founded. His greatest dream was to see the Turkish nation developed in science and economy; to see them tiredlessly working as a nation. However, he was not able to see the resolution and decision, the successes gained of his nation swearing to this aim. How happy we are, we have seen the most magical work of creation live among us… Like the secret worship in our years of calamity, we have remembered his sacred name trembling with excitement. Let his honoured name reach the happy generations of the future; let them also know the epic of victory of this hero, who was admired by the world. Ye Sacred thought!… Ye victory! The sun of the freed risen in the horizons of Samsun has set ablaze and destroyed the occupying forces and the theocratic administrators. At the same time he became the light of the captivated nations. This sun is Mustafa Kemal Ataturk. The Turks are the conquerors and rulers of the twentieth century, since the greatest man of the twentieth century has been brought forth by the Turks. Ataturk understood well our need and obligation to become a national state, has formed it through his rational practices and placed it on its real course. The only work to be done is to continue on the course he has shown. Ataturk was the man who turned the heart of the Turks from leaning for centuries towards the middle ages, their eyes from looking towards the deserts of Arabistan to civilization, to the present century and future. Ataturk has been a source of inspiraton not only for us Turks, but for humanity. Whatever he did and said was an example of deepest thought and comprehension, highest patriotism, largest human feelings. 1- Of course would he prefer the western freedom front. 2- Allying with America would be appropriate for him. However, with an agreement to be made with America he would protect the high interests of our country and he would think that the geography of our country is at the same time defending America, and thus he would make two party agreements more useful to us. 3- In the domestic politics of today nothing would be different as to the constitution. However, in the laicism affairs he would execute a more definite and sensitive policy. Furthermore, he would work for a more qualified and informed education, especially in the areas of positive sciences (technical and rational knowledge), of the theologians. He wished this deeply, but his life did not last long enough for this. He never accepted concessions on his reforms. If needed, he would have thought of harsh precautions to prevent this. He was the great hero who loved this land most and who wished it to develope in the shortest possible time. An intelligence fed with an extraordinary strong memory, a progressive presentiment, a sound common sense, drawing unmistaken conclusions, fitting judgement, definite decision, strength of rapid execution. Kneaded among dreams, plans, secrert publications, organizations, exiles, revolutions and reforms, the child of an idealist generation, matured still young through many experiences! Ataturk was middle sized,almost tall. Since his stature was very well formed, he has always made an impression of to being taller. His broad and full shoulders and chest were proportioned and drew attention. His body was fully harmonious and there was no aesthetic deficiency. A statue-like awe in his attitudes, lively and swift movements, and an elegant excellence dazzled everybody. His head, appropriate to the largeness of his shoulders and chest was large and formed, and crowned by blonde hair. This extraordinary hair, since leaving at both sides a more open forehead, was neatly combed back and resembled a lion’s mane on top of a man’s head. Frowning but not curved eyebrows increased the characteristics of the face as if wound up and twisted backwards. And below these thick eyebrows there were the large, slightly casted skyblue eyes glittered and lit up with light,the meaning of which changed each moment. The high cheeks were prominent and since the eyes were fairly apart from each other the face could be seen from the opposite and the nose, being perfect, stood large as to feed the importance of this muscular face with its full wings. Especially the symbolic motions of the wings showed the high sensibility of the character. The tight closing of the thin lips, the sound stature of the chin expressed the will power of his soul. 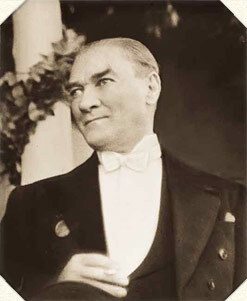 Slim and long-fingered hands, the hands of an artist which expressed not destructiveness but constructiveness, the beautiful hands, which with harmonious gestures increased elegance and eloquence, completed the character of Ataturk and pointed always to the basic points and horizons to be reached. The English Military Attaché Armstrong describes a ball night in his work “Mustafa Kemâl”. He says that among those who left in the morning only Ataturk left with the same care as he came in, from the knot of his necktie up to the ironing of his dress. This person who paid so much attention to his outer appearance is at the same time a treasure of knowledge and thoughts. None of the works he did were casual. All bear the deep traces of a mature consciousness. These new ideas forming in a well thinking mind sprung out when the days came just like colorful chicks out of eggs and amazed the audience. These are lovely ideal birds. Beauty lives in the harmony of this reality and harmony lives in the beauty of this reality. We advance through the ages year by year, because our measure is its speed. The heritage of the past, up to the ways of thinking, we have donated to the past. With a new system of feeling we try to be a model for humanity! Such an educator is Atatürk. It is difficult to know him through his deeds, we have to comprehend him by the high mathemetics of the life he lived and the things he thought which cannot be fit into material measures. This might smiling to impossibility and embracing gaps has best been understood with the unknown great might. He is deep psychology noticed more from day to day, a logician forming ideas as he wishes, an educator leading the way to the world and finally a model of great man thought of by philosophers! In this figure, which will immediately attract you, live creative pleasures in their last development. No actor was able enact his gestures just as Ataturk. Maybe he is the best dressed man in the world. Ataturk is a being who immediately sweeps off the pessimistic feelings and who immediately instills his surroundings the necessary joy and power for working, for being strong, advanced and happy in the country. Above all, he had such a sensitivity, attractiveness in his own stature, behaviour, look and speech, that he pleased from the beginning and everybody liked him. The sweetness of his conversation was unequaled. And in his presence subjects of social sciences, of positive and useful character were always discussed. He himself was solid knowledge and politeness. As far as etiquette was concerned, I don’t remember coming across more noble manners than Ataturk’s. Most heroic soldier and best commander in the battlefields, most polite and civilized man in the ballroom, most successful teacher, who wished to transfer the whole country into a school, the most efficient and far-sighted chief as the head of state, the least astray, the most sensitive diplomate, the most loyal friend in personel relationships, the most fervent patriot as regards the nation’s and country affairs, the most hard-working researcher in scientific researches. I don’t know, a man who wants to do everything perfectly. We define him only with the name Kemâl Atatürk. While remembering this name, don’t let us forget all these meanings. The main duty of the Turkish intellectual is to search for, understand and extipulate the reality of Ataturk. If Mustafa Kemâl Pasa had not begun the battle, this country would not have been saved. If the weak, but nation-wideresistance movements, which began in places subject to danger in the west, east and south and which were the product of a patriotic thought, had not been united by Mustafa Kemal Pasa, each could have been supressed. May he sleep in peace, great savior. The Greek armies were marching on to Ankara. Early in the morning we met at the National Assembly. We were going to be informed by him. - We shall beat the enemy here. We believed him, why and how we believed, I still don’t know. He took this duty and vanquished the enemy at the line he drew. He returned from Sakarya to Ankara with a childish smile. By his personal effort, he had won a battle, which would have been the absolute end of the Turkish independency, if he had lost it. Ataturk is a enormous national power for the Turkish Nation. He is the greatest spiritual support of our existence. The dream of a happy and prosperous Turkey is the sole wish of the Turkish youth who has taken an oath to walk in the illuminated traces of Ataturk. This wish shall blossom from day to day and strengthening it will pass from one generation to the other. Ataturk had a dynamic soul. A man enraptured by him cannot remain in the same place. Ataturk owned developing and enlargening thought. Those who follow him do not lag. Ataturk is our leader, our light for today, and for tomorrow. Following you involves the cheerfulness of definite success. When you enter eternity, the Turkish generations shall walk on your footsteps. The interest of the Turkish Nation’s claim is only in you. The life of Atatürk proves only one eternal case. Success is always that of singular ideas. The hope of this mighty man was not in strength, but in intelligence and justice. Ataturk was ready to sacrifice his position his nation could give him in the highest period of prosperity for his ideas. Never was there any concession, any recession, any contradiction. Above all there was a sympathy, attractiveness in himself, his stature, his behavior, his look and his speech, he pleased from the beginning and everybody believed him. A great soldier, a great reformer, but above all a great idealist. He walked in the direction the common sense of this nation showed him, under the light of science for the happiness of all of us. The historians and his relatives talking of him said: – Ataturk was a realist. He did what he had to do. With a look he could defeat and with a stroke he let us touch the skies. When we lined up in crowds at the edge of death with his signal, we understood how human we were and we tasted the great pleasure of living for ultimacy. Therefore, they won’t be able to find the things seen in the managing of war and attacking the enemy in any other period of history. The sun has never heated any nation as this one and has never given blessings to any nation asthis one. No period in history has ever enlightened its surrounding as his period did. ATATÜRK is the only source of inspiration for the dynamic Turkish Youth who are, like a torrent or lighting, running for a luminous future, contemporary thought, and the ideal of a modern and powerful Turkey. He would enter the trenches as if he was a commander of General Staff entering a parlor. He would frequently come to the trenches towards which the enemy’s cannons were Aimed, waiting stealthily with their fire-scattering mouths; he was standing with us shoulder to shoulder and scrutinizing the enemy’s trenches. I was still trembling while showing the way to him despite the fact that I was used to the life in trenches not for days but for months. Nevertheless, he would always straighten up stepping on his toes and look the enemy’s trenches over our trenches. We could not raise our heads from the trenches because of the enemy’s heavy fire in Çanakkale. But he would just watch this intense fire even without blinking his eyes. I first came to know him as “The Man who does not know what fear is”. Since the time we heard his name and learned his heroism we felt our health, recognizing our vigor, and enjoying the joy of living which was forgotten long ago. Once we were orphans, we found our Father; He became our Father (Ata). We were poor and he brought us wealth and comfort. He was one of the leading characters of the post war period. He formed a class individually and mostly he was unique. Europe has lost one of the few creative post war statesmen that appeared on the scene. He added an exceptional energy and an intellectual radicalism to his merciless power and huge ambition. He never got influenced by historical traditions and religious sentimantalism. He always balanced them with his mature policies. No name in this age has gained such reputation as the name Atatürk. Turkey was once believed to be an unnecessary member of Europe but under the leadership of Atatürk it became a valuable and revolutionary member of local policy. The most gentleman, dependable and friendly statesman of the era is Atatürk. If the dictators and the democrats of this age were to be gifted like Atatürk, the world wouldn’t have been seperated into two. Atatürk was the living example of dignity and honour in a world where these two values are only remembered in words. Everyone is crying for the death of Atatürk. His life will always be remembered as a great statesman, a great soldier, a great man of dignity and honour. England salutes this great man whom at first was a brave and noble enemy, then a loyal friend. He was a totally exceptional statesman. He has done things that dictators can never tolerate, even the democracies cannot realise or have not realised. Such men in history have always given their names to eras. They are really exceptional. No civilized name can create such respect as the name Atatürk. Atatürk is not only a man that changed the life of Turkey, but is also a man who has done only good things in the international arena. Kemalist Turkey has shown all the world how to get into its well deserved honoured place among the leading countries of the world by strong national economic policies. The Turkish Reform lead by him personally has brought a free and confident life to the men and women of his nation that no other generation in the history of Turkey had ever achieved. His success made Turkey a European country and changed the history of the near east. Atatürk was a leader in the spirit of the Turkish Nation that resembled the national flag. The presence of that young and ingenious Turkish Leader at Dardanella was probably the most unfortunate occasion for the allied forces. It is necesary to explain the reality in the battlefields at Dardanella. We are now trying to resist the brave Turkish Army, lead by a brave and clever commander. Our generation has witnessed many strong men gaining power to lead their countries. But if studied carefully, it will be seen that none of the reforms generated by other nations and states are as well considered as the ones generated by Atatürk. Atatürk is a fresh and a brave leader because he did not get involved with the beliefs of old. We can say that he is the most powerful statesman of Europe today and there is no doubt that he is the most corageous and original statesman of all. The death of Atatürk, who saved Turkey, leaded and elevated the Turkish Nation, is a great loss for both Turkish Nation and for Europe. The teardrops of the men and women from all social classes of his country are the well deserved proof of the good and right deeds this great man has done in his life. The foreign policy of Turkey designed by Atatürk has put Turkey among western nations and old enemies have become friends. His resistance at Galippoli peninsula in WW I and his ingenious struggle in the War of Independence has brought him glamorous victories. He has managed to cope with unexpected difficulties and misfortunes with the help of his high spirit and patience. I commemorate Mustafa Kemal Atatürk on his 25th death anniversary with deep respect. Atatürk’s name was known in our country 50 years ago as a brilliant Turkish military commander. After peace was maintained we had the chance to meet him as the Atatürk with his statist features that has put him among the great national leaders in history. Today, Turkey is in partnership with England in Western unity. England and Turkey share the same general policies and are in contact in various fields. This is mainly a result of the deeds of Atatürk. On the 25th death anniversary, I respect him as a brave soldier and as the Father of modern Turkey. We will always remember him as a satatesman in admiration and in respect. Some people regarded Atatürk as a dictator. I say this is wrong and such a thought will lead you on a wrong path. Although the term dictator is well suited to Hitler and Mussolini, actually there is no definition of a dictator. In this case, one may ask, why do you put Atatürk aside from this term. I have many reasons. First of all, Atatürk was leading a scientific study for the times that he would not exist. His intention was to develop a governmental and constitutional system that would operate after him. He never forced his people to believe in his vision. Instead, he tried to teach and explain his ideals to them. He had taken the decisive power of his nation from the Great National Assembly at the time of the War of Independence while he was planning the future with his friends. The members of the Assembly were elected by the people. The President was elected every four years and the Assembly had the power to rule as well as the power to pass laws. Atatürk’s respect for the Great National Assembly is important. His main concern with the interior affairs was to create a living political organism with the capability to react promptly to situations that might arise. If he were alive, I suppose that he would refuse to be a candidate for the Presidency and stay aside to observe if the mechanism would function as well as he wanted it to. I am not sure if his friends would accept this, though. Atatürk’s reform will be continuous. Because this reform has enabled Turkey to change completely after the war and this strong nation has no enemies anymore. This is something no other human being has ever achieved in our time. Today, Turkey is a big and a new country. This new Turkey had found itself in the personality of Atatürk after the treachery, misery and the wearinessof the war. He gave life to this new Turkey. One of the most popular papers of England states that Atatürk is the greatest man of our era and history. It also mentions that his value cannot be compared to any other great personality in history. While mentioning Atatürk, the paper gives examples from various eras and some distinctive characters remembered in those times and states that Atatürk can never be compared with them, being a great reformer, a great soldier and a great statesman. The paper reads, in order assess Atatürk, it is not enough to follow his way. One has to be as clever as he is and has to make decisions as fast and correct as he does. The paper states that no other great man in history has ever achieved the privilage to rise to his level. I am proud to attend to the 25th Anniversary of the Memorial Ceremony of Atatürk’s death. Atatürk reminds us of many things. The historical success of great leaders of this century, leadership that inspires the Turkish Nation, the supreme vision of the modern world, and as a soldier, high determination and bravery. The birth of the Turkish Nation from the ruins of a collapsing empire, New Turkey’s decleration of its freedom and independance in honour and protecting it since then are the work of Atatürk and his Nation. There is no doubt that the revolutions he has carried out in his country shows how the trust of a nation brings success. There is no other example like this. I am sorry in two ways. First of all, I, like all the world, am sorry for such a great man to pass away. Secondly, no matter how much I wanted to get to know him personally, it is now impossible for me to do that. He was one of the greatest leaders of our age as a soldier and as a statesman. He has made Turkey take its deserved place among the most developed countries of the world. He has given the Turks the feelings of confidence and endurance. I am proud of myself for being one of Atatürk’s loyal friends. Hearing this from a brilliant statesman like Litvinof, who I believe is the most remarkable one of his kind after Disraeli who was once in charge of the United Kingdom, I thought these words were of great importance. It should not be forgotten that Kemal has shown a brilliant strategy at Dumlupınar and has succeeded in making use of the Turkish forces that were less in number. What the Greek army faced is an exceptionally rare defeat that only a few occupying armies have witnessed in history. General Charles Sherill, Former Ambassador of U.S.A. He won Lausanne; the first victory Old Asia has won over Europe win in two centuries. One of the most attentive and attractive men has passed away from the stage of the world. He was one of the most talented leaders of the post war period. There is a proof of perfect leadership in his dominant eyes. His thick eyebrows never stay still. They rise to high, intellectual peaks and get crossed suddenly to form indescribable cracks on his forehead. He has a fare skin, tanned. He is not a brunette. His hair is blondish brown. The clean cut features of his mouth and chin show his certainity in his decisions. He is always alert, straightforward and very intelligent. The American Government is in a deep sorrow because of Atatürk’s death. This sorrow is not limited to the Turkish Nation and their borders. It expands widely. Kordel HALL, Secretary of State, U.S.A. This Turkish man, admired by the whole world, has made the Turkish people proud of themselves, their history and their language. For the future of his nation, he has generated such a great power that has not been generated in the past several centuries. Mustafa Kemal has achieved success mainly because of his endless patience. Atatürk’s devotion to his country was highly respected by the whole world. F. D. ROOSVELT, President of the U.S.A.
America admires the determination, courage and the results of Atatürk’s deeds that many people can never achieve. The wonder of Atatürk will symbolize the spirit of the Turkish Nation in history. History will never forget the name of this statesman. Atatürk is a man of the people. His determination, sharp mind and power has raised him above his fate and he has been the founder of Turkey.